Erected 1922 by The National Society of the Colonial Dames of America. Location. 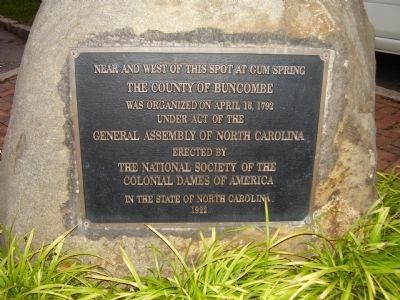 35° 34.028′ N, 82° 32.554′ W. Marker is in Asheville, North Carolina, in Buncombe County. Marker is at the intersection of Biltmore Plaza and Kitchen Pl on Biltmore Plaza. Touch for map. 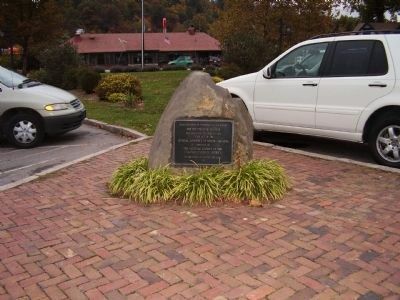 Marker is in this post office area: Asheville NC 28801, United States of America. Touch for directions. away); Smith-McDowell House (approx. 0.8 miles away); St. Genevieve ~ Of ~ The ~ Pines (approx. 0.8 miles away); Stoneman's Raid (approx. 0.9 miles away); Asheville Normal School (approx. 0.9 miles away). Touch for a list and map of all markers in Asheville. More. Search the internet for The County of Buncombe. Credits. This page was last revised on June 16, 2016. This page originally submitted on October 22, 2008, by Stanley and Terrie Howard of Greer, South Carolina. This page has been viewed 1,076 times since then and 9 times this year. Photos: 1, 2. submitted on October 22, 2008, by Stanley and Terrie Howard of Greer, South Carolina. • Bill Pfingsten was the editor who published this page.